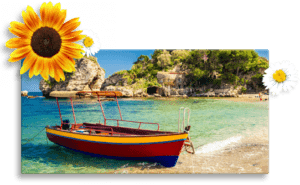 When will your acrylic print be delivered? Other Assembly instructions included Assembly instructions included Drilling & assembly instructions excl. Having your own photo printed on acrylic glass has become a popular option in the last years for customising your home decoration. 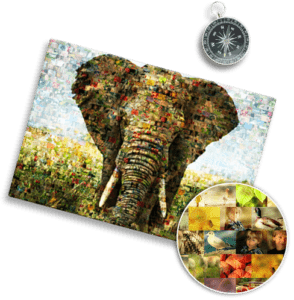 The on-trend material properties of acrylic prints are what make the product so popular, since the glass has a high-gloss surface that is absolutely trendy right now. 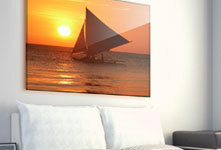 Additionally, photos on glass have the vivid colours and a sharpness that cannot be achieved by printing on canvas. 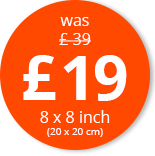 As a premium version of the product with 8 mm thick glass, the acrylic print has even more special appeal. The 8 mm glass and clear polished edges create the impression of spatial depth. The viewer has the impression of being able to see into the photo. 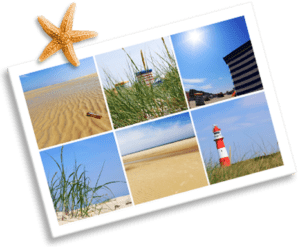 As a carrier medium for photo printing, acrylic glass photos – which is known to many as Plexiglas – is ideal. This is because, in contrast to mineral glass, it is not only much lighter, but it also won’t shatter if it falls to the ground. The acrylic glass XT (with the beautiful chemical moniker of “polymethyl methacrylate”) that we use for printing is manufactured in a special extrusion process. This creates an extremely smooth surface that is suitable for direct glass printing, because on even surfaces we can print with the highest DPI. Several different processes are involved in glass printing. We use cutting-edge methods and print directly on to the back of the acrylic glass sheet. This is only possible in that we also print “white” in addition to the classic CMYK. The white completes and seals the photo print on the back, and is applied in two layers in parallel printing. 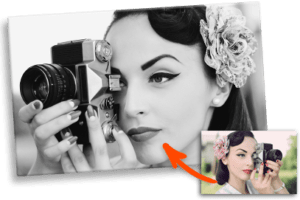 Printing the photo on to the back of acrylic has the advantage that the colour layer is applied directly on to the glass. Other manufacturers simply stick a poster on to the back, which over time peel away from the glass. Acrylic glass printing is a sophisticated print process and the materials used are top-quality and expensive. Accordingly, it is difficult to offer acrylic prints cheaply. However, we regularly offer discounted promotions on our website, so that our customers can get to know the product. 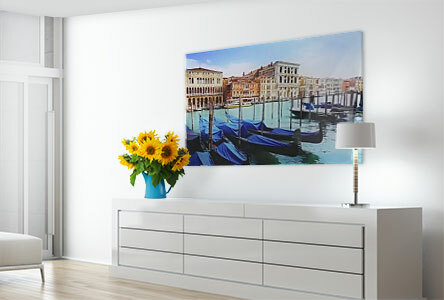 Another trick to order cheaper acrylic prints: Choose a large format. The large format is always better value in comparison. Need an example? The 20 x 20 cm glass photo costs £39. The 40 x 40 cm version costs only £59. The larger format is four times bigger but costs only £20 more. 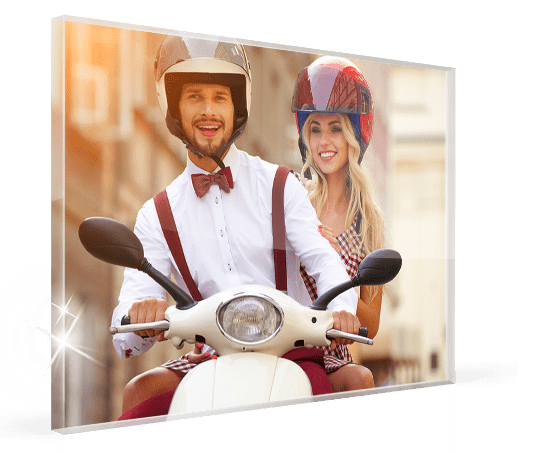 So if you want the best deal acrylic glass photo, you should always go for a larger format. 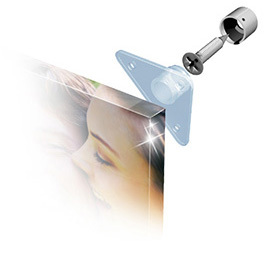 Couple: This “free-floating” hanging system is suitable for acrylic prints of up to 6 kg in weight. It is stuck on to the back of the picture and is suitable for a wide range of products. However, in the case of very light-coloured motifs, the hanging system may shine through the picture. Ghost: This is an economic hanging solution that is suitable for small formats. 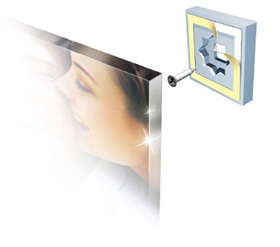 It is stuck on to the back of the acrylic glass photo and can bear weights of up to 0.6 kg. This system also gives a “free-floating” impression. Steel20: In the case of large formats, the hanging system cannot be glued on. Especially in the premium versions, acrylic prints can easily weigh more than 20 kg in the larger formats. This is too much to secure with an adhesive hanging system. 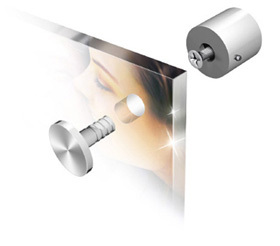 In these cases, we recommend the Steel20 system, which is attached to the wall using holes and stainless steel pins.